Are you tired of tripping over your wired headset or forgetting to take it off and knocking half of your stuff over? We sure are. By using a wireless headset, you can move around freely whether you’re watching movies, listening to music or playing games. You can also keep up with what’s going on voice chat and in-game even when you take a bathroom break or go to get a snack. Best wireless gaming headset. Despite a bump in the price, a wireless headset is a game changer in our opinion. So If you’re in the market for a new headset, consider taking the wireless route. If you’re not sure what to look for when choosing a wireless headset, read our buyer’s guide, that we’ve written at the end of this post. 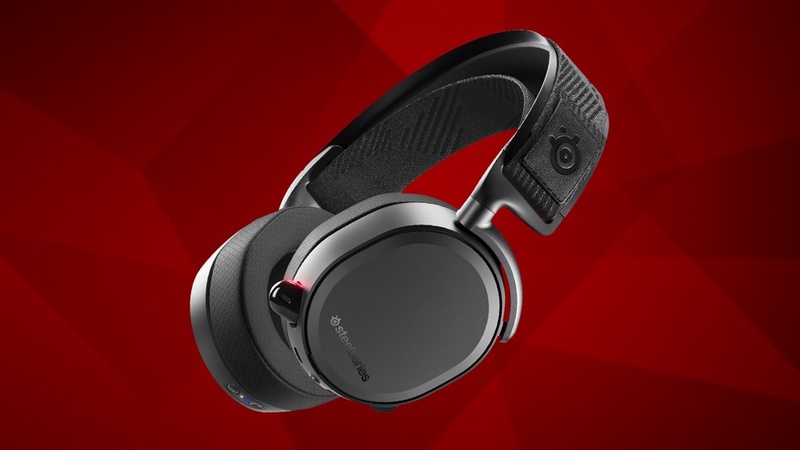 If you’re ready to see what are the hottest products at the moment, we’ve reviewed and put together a list of some of the best wireless gaming headsets available in 2019. Read on and check them out. In case you’re doing more gaming shopping, we’ve got a few more great articles covering other gaming peripherals. If you’re looking for a gaming mouse, check out our best wireless gaming mice article, in addition to that, don’t forget to get the best gaming mousepad for your newly purchased (or old) gaming mouse. Also, if you don’t yet have a mechanical gaming keyboard, we strongly suggest you consider getting one, as the playing experience is much better with those. And finally, we’ve got the best gaming screens covered as well. 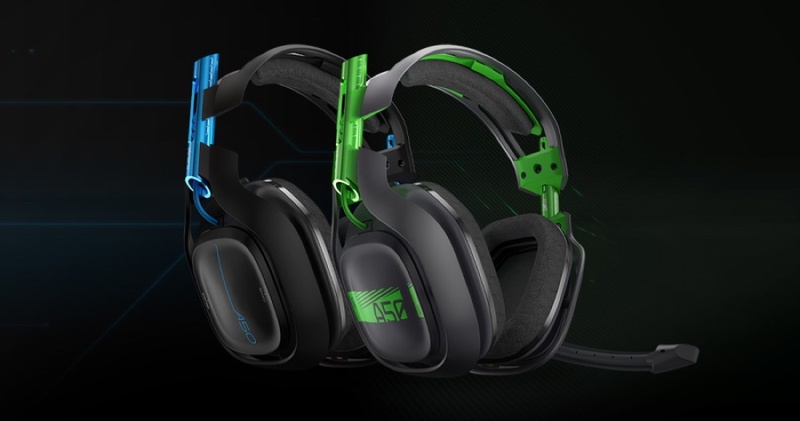 Flashy gaming headsets seem to be the norm rather than the exception. 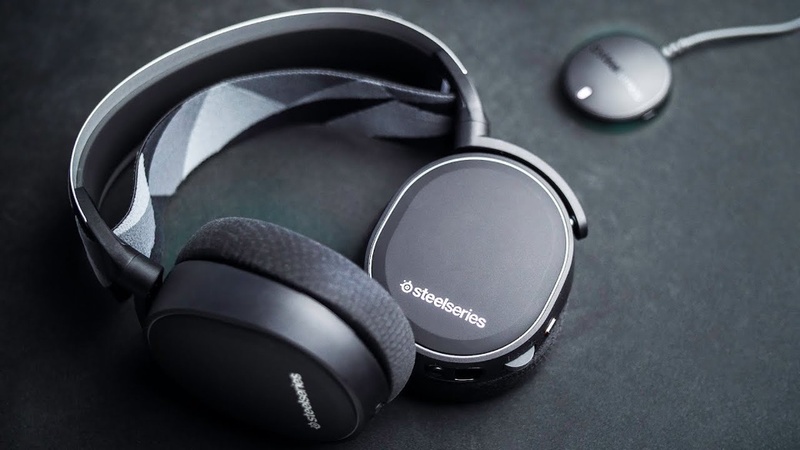 So if you’re a fan of the sleek, minimalist look, the Arctis 7 from SteelSeries is the headset for you. It comes in two different colors schemes, one black, and the other white. But it isn’t only appealing when it comes to looks. It has very comfortable and snug ear cushions and an adjustable headband like the ones you’d find on ski goggles. When it comes to sound, the Arctis 7 is also impressive. It features the S1 audio driver present on more expensive SteelSeries headsets. As a result, the sound is rich and full which makes them good across the board for a variety of uses, not only gaming. Moreover, there’s support for virtual surround sound on PC and the ChatMix dial lets you adjust levels between chat and game sounds on the fly. If you need to personalize audio settings you can do so with the SteelSeries Engine 3 software and save your presets. Finally, the retractable microphone has a clear sound that’s as good if not better than what the competition offers. Bottom line: If you’re looking for comfort, quality audio, and long battery life, this is the headset for you. However, it works best with a PC and the PS4. Even though the design of the Astro A50 may not appeal to everyone, its comfort and ergonomics will. This top of the line wireless gaming headset doesn’t fatigue your ears and gets along well with glasses. Moreover, it applies little pressure to your head, so it’s great for marathon gaming session. As expected from this price range, the sound quality is excellent. But there’s some sound leakage with the open-back design on higher volumes. Luckily, the A50 mod kit (sold separately) offers synthetic leather ear cushions which solve this problem. The detachable mic with on/off flip feature picks up crisp sound whether you’re using your PC or console. Thanks to the Astro Command Center, there are lots of customization options on this Dolby 7.1 Virtual Surround headset. 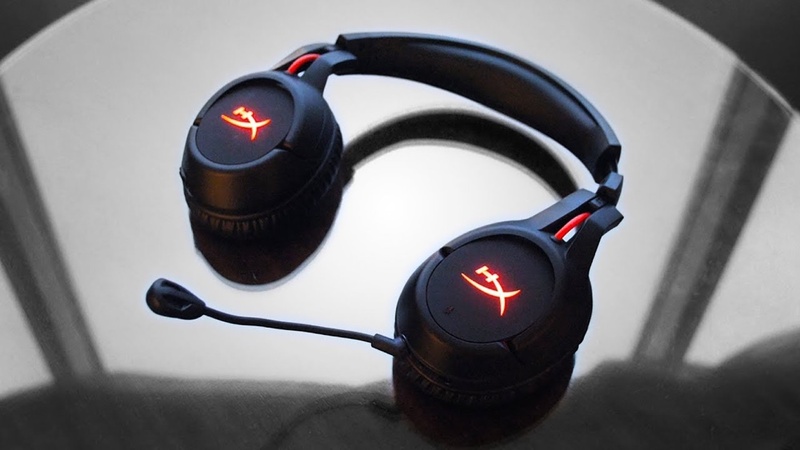 Moreover, this headset has MixAmp technology which lets you adjust game/chat volume balance. Another important thing to note is that there are two versions of this headset. One is PC/XBox One compatible, while the other works with PC/PS4. However, both come with a docking/charging station. Bottom line: If money is no object, then you will want to consider the Astro A50 wireless gaming headset. It’s comfortable, it sounds great, comes with a docking/charging station, and has two version: one for Xbox and the other for PS4. It’s down to personal preference, but the Logitech G933 looks stunning to us. With this wireless headset, you can customize RGB lighting to match other Logitech products. 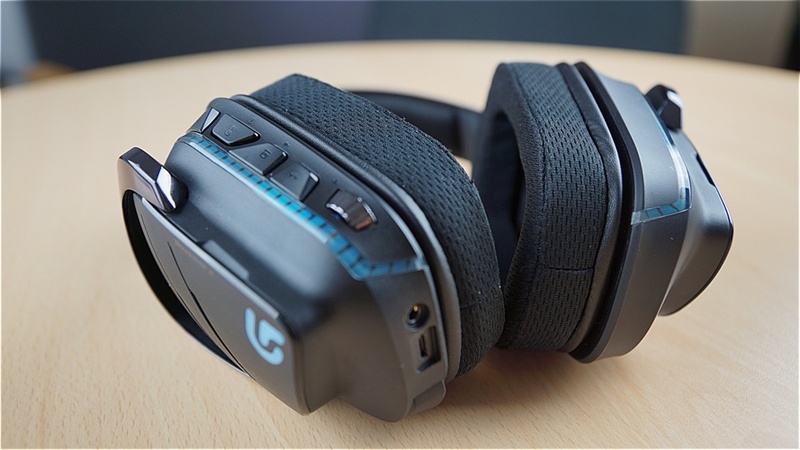 And when it comes to ergonomics, we found the G933 and its cloth ear-cups very comfy for longer use. However, they do have a habit of sliding off when you tilt your head back, and the adjustment slides seem to be a bit loose. The sound on this headset is impressive thanks to the Logitech Pro G audio driver. Even though it’s a bit bass heavy out of the box, it can be tweaked through the customization panel. There is support for 7.1 Dolby, DTS Headphone:X which you can swap between or turn off. Even better, there is multi-source audio mixing available. That way you can answer calls, play games and listen to music with this headset. With programmable keys on the ear-cups, users can flip through EQ and light presets, and switch surround sound on or off. The extendable boom mic works very well and gets muted when you retract it. Bottom line: Great compatibility, comfort, lots of customization options, and high-quality audio at a great price. Comfort wise, the Cloud Flight is a wireless headset that you can wear for hours without issues. Its light weight is due to an all-plastic design except for the adjustable steel slider. But the rotating ear cups tend to feel fragile. When it comes to sound, you can expect high-quality reproduction all in all and a punchy bass. However, this headset is stereo only and doesn’t come with special software or EQ customization options. The detachable mic also offers great sound along with a mute button on the left ear cup. An important thing to note is that the microphone (and volume wheel) don’t work with a wired connection which limits versatility. On the upside, you get some of the best battery life and wireless range with the HyperX Cloud Flight. Bottom line: Light and comfortable, the Cloud Flight has a large wireless range, a very long battery life, and good stereo sound. If you need an Xbox compatible wireless headset, look elsewhere. Thanks to memory foam cushion, this headset is very comfortable and adapts well to the shape of your ears. It’s also well suited for larger heads. Furthermore, the plastic used feels a bit cheap, and the grip of the headset is light so you might find it slips when you tilt your head forward or back. Since this is a less expensive headset, the sound quality is decent but nothing spectacular. 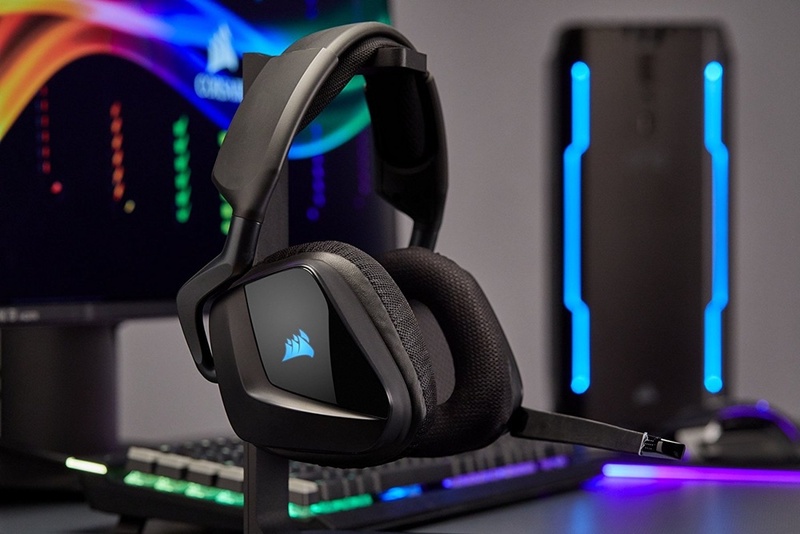 The Corsair Void Pro RGB Wireless comes with Dolby 7.1 Virtual surround sound. By long pressing the volume button on the left ear cup, you can turn this option on or off. At the same time, a short press changes EQ settings while providing a sound notification. Customization is available for both the EQ and lighting, but the RGB LED lowers battery life significantly. The microphone works well, comes with a flexible/retractable arm, a mute button and LED indicator. The biggest downside to this headset is the fact that it only works through Wi-Fi with a PC. Bottom line: The Corsair Void Pro is cheap, comfortable and has a decent sound. Unfortunately, it only works with a PC or Steam Link through its USB dongle. Just like the Arctis 7, the Arctis Pro has a one-size-fits-all adjustable headband. Along with breathable and soft ear padding, this makes the headset supremely comfortable in our opinion. With support for DTS Headphone: X v2.0, this headset has remarkable sound quality. The collapsible microphone is great for gaming and is more than adequate for streamers. Instead of using a USB dongle, the Arctis Pro Wireless comes with a black transmitter/base box that includes a battery charging port. The base box has a small OLED screen and controls for adjusting various settings like EQ and chat/game sound via ChatMix. It also has an option to save your presets. Then there is Bluetooth support so the headset can be used for music and calls. Finally, you get two easy-swap batteries -the same ones used in the Siberia 800 series – which cost $20 and are readily available. Bottom line: Top-of-the-line sound and comfort, as well as excellent connectivity and replaceable batteries, makes this headset a worthy choice for anyone who can afford it. However, it doesn’t support the Xbox. As is the case with most products, there are a lot of models to choose from when buying the best wireless gaming headset. But to cut through all the marketing terms, we’re going to focus on the most important aspects. Everyone looking for a headset should choose according to compatibility, comfort, sound quality, and price. First of all, using a comfortable wireless headset makes perfect sense when you consider how much time you’ll be wearing it. The key parts responsible for comfort are the headband and ear cups, along with weight. But most products in the mid to high-range are fairly light, pleasant to wear and adjustable. When it comes to sound, it depends on taste. Headsets can be everything from neutral to bass-heavy out of the box. Luckily, most offer an adjustable EQ with presets so that you can set them up them according to your needs. Finally, for some price will be the deciding factor. But if your budget isn’t set in stone, spending a bit more will pay off in the long run. In general, quality wireless gaming headsets start at 100$. 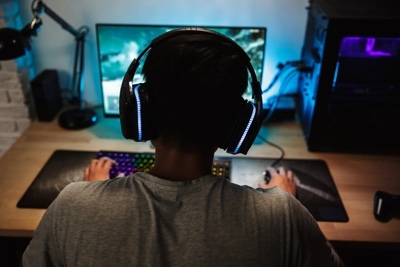 The three main ways of connecting gaming headsets to your PC or console are USB and 3.5 mm, and the third is an optical connection. USB connections are digital which offer superior signal quality. But a lot of computer peripherals (keyboard, mouse, printer, flash drive, etc.) use USB. In other words, you might not always have enough ports to plug in everything that you want. Another downside with this connection type is that not every device has a USB port or it might not offer audio output through these ports. Good examples being smartphones and tablets. Besides that, USB ports on TV don’t usually provide output for audio. If you want to customize and tweak settings, USB headsets are a great choice as they come with special software. But you can also use Windows Sonic or Dolby Atmos on Windows 10 or Xbox to get virtual surround sound. Unlike USB, 3.5 mm connections are much more prevalent. You can find them on your desktop and laptop, on your TV set, tablets, and mobile phones. Headsets with a 3.5 mm jack also work with a PS4, Xbox One controller and the Switch from Nintendo. Furthermore, this type connection is only used for audio. That way you won’t have trouble finding ports to plug your headset into. An optical connection (S/PDIF) is like USB because it is also digital. At the same time, this port is like the 3.5 mm one – it is only used for audio, so you’ll always have it available. But this type of input is most often a part of higher-end motherboards and dedicated sound cards. Fortunately, you can find them on newer TVs and consoles like the Xbox One and PlayStation 4. Open-back headsets allow some outside sound to come in and mix with what you hear through your headset. They also let the sound come out, so if you turn up the volume, chances are people around you are going to notice. When it comes to ergonomics, an open design tends to be a bit more comfortable. It has more ventilation, and to some people, they have a more natural sound to them. On the other hand, Closed-back headsets limit the amount of outside noise as well as the amount of noise bleeding out. If you like to turn the volume up late at night, for instance, a closed-back design will come in handy. But the downsides include a somewhat restricted airflow and a bit more pressure on your ears. Finally, because sound doesn’t bleed out, you might find that these types of headsets have a heavier bass. Most of the time, you’ll find one of two types of mics on wireless gaming headsets. Most headsets come with unidirectional microphones and pick up sound from one direction. This is useful because your buddies on TeamSpeak won’t hear background noises from your house. There are also bi-directional microphones which take in sound from the front and back. This creates a proximity effect which boosts the frequencies used when talking and produce a higher-quality sound. They also filter out unwanted noise better. If you come across a gaming headset that is noise-canceling, it will most likely have a bi-directional mic. With stereo, you get a left and a right channel or one driver for each ear cup. In contrast, true surround sound (7.1 in most cases) tries to fit a subwoofer and seven different drivers into two ear cups. But when companies can’t fit all this into a headset, they resort to using stereo drivers and software to recreate surround sound. When this is the case, you get virtual 7.1 sound which in most cases is either DTS Headphone:X surround sound or Dolby Virtual 7.1. However, virtually all gaming headsets can switch surround sound on or off. Practically speaking, surround sound is good for movies and games with single player campaigns. But if you’ll be spending most of your time playing games online, a stereo headset might be a better choice. With only two drivers and limited space within ear cups, stereo makes it a bit easier to determine where a particular sound is coming from. Driver or speakers found in your headsets are mostly referred to by their size. They range from 30 to 50 millimeters in most cases. They can be as small as 20 millimeters in true surround sound headsets. But a certain size doesn’t always equate to quality. Many factors play a role in sound quality such as speaker material, weight, tuning, ear cup size, and so on. Unfortunately, this information is not always widely available. However, some brands use the same driver in more than one model. A great example is the S1 driver in the Arctis 7 model from SteelSeries which comes with more expensive offerings as well. I hope that this post helped you to find the right “perfect” wireless gaming headset, if not, please let us know in comments, what do you think is the best headset and why. If you have any questions, do not hesitate to ask them in comments too. Logitech G933 is an amazing headset. I had astro A50 before that, but didn’t like it. Logitech is way better, more convenient for me.